When I was a kid one of the things I used to love doing was rooting through the presses in my parents kitchen. 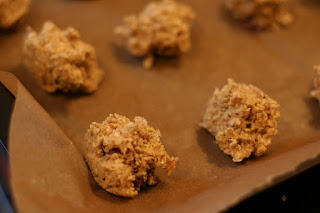 I would always find chocolate chips, glacé cherries and different nuts that my mom used in baking. There was only the one jar that I tasted something out of once and then never went back to. That was the jar that contained crystalised stem ginger. Ginger has such an odd earthy taste to it, sweet and hot and not at all to the likings of my very junior tastebuds at the time, but something that I use quite a lot in cooking asian food now. It was only recently chewing on an aerlingus cookie on the way to New York that I realised I had never used it in baking. 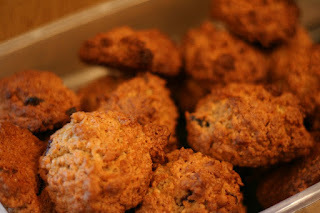 This recipe is a slightly modified version of the Oatmeal and Raisin cookies in Rachel Allens book Bake (a book I would definitely recommend if you have even the slightest of sweet teeth).